Animated Bounce is an excellent SVGA remake of Arcade Volleyball, a very popular freeware 2-player volleyball game that was easy to learn, but hard to master. The original game inspired a number of remakes, including the excellent Zorlim's Arcade Volleyball which unfortunately never got finished with computer player implemented. Like the original classic, Animated Bounce is a very straightforward game: pass the ball over the net to the other player. 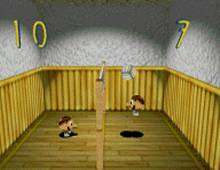 Like the actual volleyball game, Each player loses point for each ball that lands on the ground on his/her side. Player also loses points if he/she touches the ball more than 3 times before being passed over the net. The first player to score 15 points wins the game. Both players are round "balls" themselves who just bounce the ball with their heads - so there is no way you can "slam" the ball into the other side's court. Like the original game and Zorlim's version, ball physics in this game is quite good - the angle at which you bounce the ball affects its trajectory and speed, and you will often bounce the ball at the wall behind you to make it go faster. The graphics are good, and the computer AI is decent. If you enjoy a quick coffee-break game in general or are a fan of the classic, check out this excellent remake that is simple but quite addictive. Too bad the designer didn't credit Arcade Volleyball anywhere in the game. Two thumbs up!